2017 competitors and finals field info added along with race footage. The inaugural Western Australian State jumper in 1904 featured a black swan, a symbol synonymous with the State as far back as its first colonial flag in the 1800s. 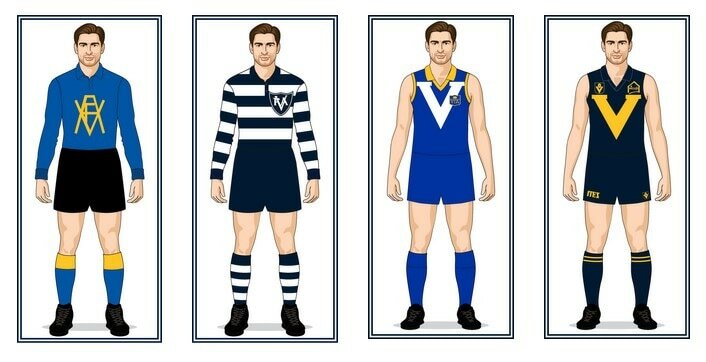 In well-over a century of representative football since, there have been just twelve seasons when the Western Australians took the field without a swan on their jumper. My thanks to Rhett Bartlett from www.tigerlandarchive.org for sending this missing info through. 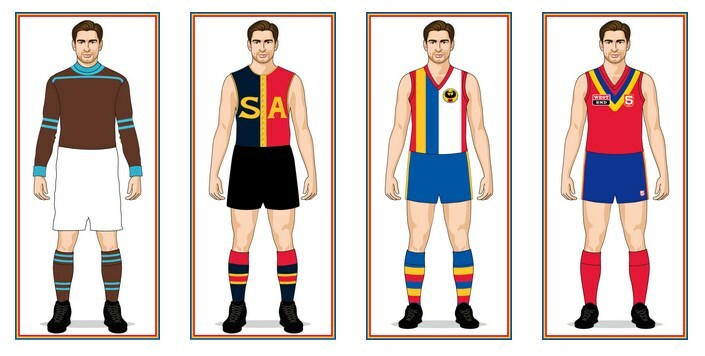 A push by the SANFL in 1929-30 for uniform State colours was far more successful and resulted in all South Australian sporting bodies adopting red, navy blue and gold. 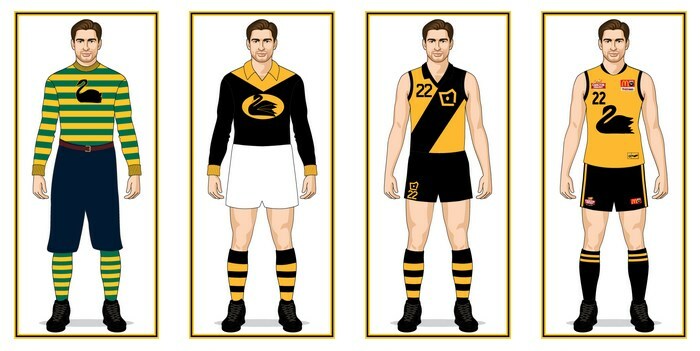 However, the SANFL could not find the right design to make these colours work, wearing six different designs in seven seasons during the 1930s. 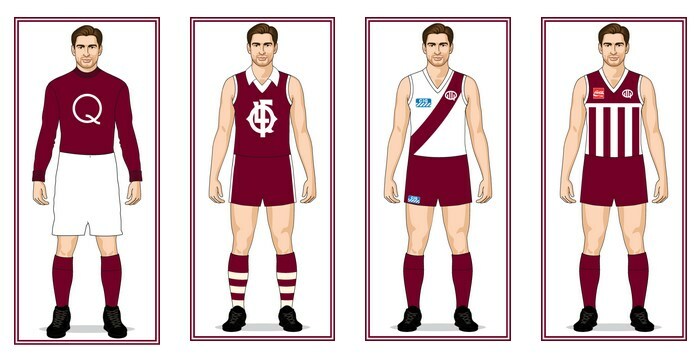 Season 1975 saw a bold, new design featuring a QFL monogram and throughout the 1980s Queensland adopted the white jumper with maroon sash. In 1991 the Port Adelaide-style maroon jumper with white stripes debuted. Essendon's Shane Heard has been identified as the 3rd-place finisher in the 1979 sprint. My thanks to Jeff Lawton for sending in this info that he found in a little snippet hidden away within the Oct.1, 1979 issue of The Age. There is scant information on these matches to be found online or in print – especially for the AFC era – and what little info exists is often riddled with factual errors. 2016 competitors and finals field info added along with race footage. 1986 - further info on the Foster's Grand Final Entertainment Spectacular that (briefly) replaced the sprint and, much like Foster's Lager itself, was an absolute fizzer. 2005 - Bannister (Carl) and Campbell (Syd) confirmed as finallists (Begley, Faulkner, Schammer and Pearce did not qualify). 2006 - Peake, (Frem), Phillips (Syd) and Notting (Bris) confirmed as finallists - full finals field now known plus placings. Very happy to announce the mysterious E. Brookes (the VFA's leading goalkicker of 1881) now has a first name! The names of a further 27 captains, vice-captains and coaches have been added to the VFA-VFL Rep Honour roll! 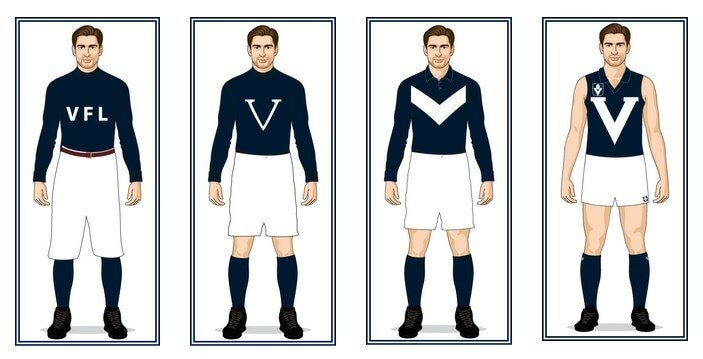 The Victorian Football Association (VFA) served as Victoria's official representative team during the 1879-1896 intercolonial era. In October 1896 their eight strongest teams broke away to form the VFL (now AFL). After the split there were brief periods when the VFA regained official interstate status; and many years when they found themselves exiled from top-level interstate football, settling for representative matches against lower-level leagues instead. The VFA's representative uniforms are remarkably varied, with many classic designs that most of today's football fans have never seen... until now! - commenced in 2001 when Tasmanian Devils joined the VFL. - missing venues added for 2001-2004. - as of 2015 the cup is no longer presented. - medal is now defunct (last awarded in 2013). - 2002-2013: awarded to the winner of Sydney-Essendon matches played in Sydney. - 2014-present: awarded to the winner of Sydney's Indigenous Round match (vs various opponents). Lots of site-wide tweaks & edits just rolled out, please contact me if you spot any broken links etc in your travels. 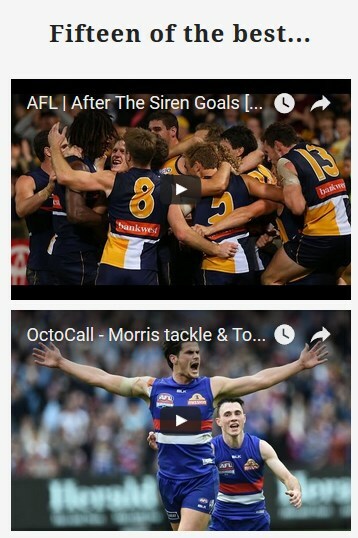 Grand Final scores, Finals records, Medallists, Premiership Captains/Coaches, etc all updated. Click the link above for the full story, including the history of each award and a club-by-club list. Whilst promotion and relegation is commonplace in other codes, in Australian football such a system remains a rarity. 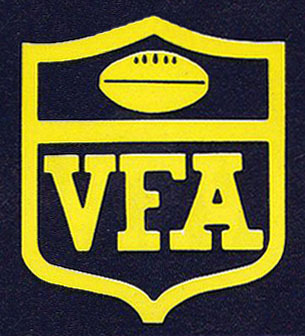 In 1961 the VFA made the monumental decision to split their competition into two divisions, adopting a "one-up, one-down" system. A handful of modern clubs such as Box Hill, and Coburg successfully survived their time in the lower tier. However, for many traditional VFA clubs relegation proved to be a one-way ticket to oblivion. This new article from HardBallGet.net explores the reasons for the VFA dividing their teams, provides a year-by-year history of promotion and relegation, and looks at the aftermath of divisional football when the competition was finally unified again after the 1988 season. The story of how a typo in The Age has now become Port Melbourne's official final score for the 1947 VFA Grand Final. My thanks to Richard Attard for alerting me to some typos in scores across the site. Amendments have been made to the 1976 VFA Lightning Premiership Grand Final (Brunswick's final score), 1976 NFL Wills Cup semi-finals (Glenelg's final score), 1986 VFA Division 2 Grand Final (Sunshine's half and three-quarter time scores),1993 VFA Pre-Season Cup (Dandenong's final score vs Springvale in the opening round), and the 2012 Foxtel Cup (Werribee's score in the opening round). VFA RECORDS updated - most games played expanded from the top 10 to a full list of the VFA-VFL's 200 game players. VFA REPRESENTATIVE HISTORY updated - photo of Victorian Football Cup added (see right) plus new info about the 1975 and 1976 games versus the OMFL. Grand Final Sprint naming rights sponsors updated for seasons 2006/07/11-13 - thanks to Matt Gibbs for emailing through info which led to these additions. September means Grand Final day at the 'G... and with it comes the annual debate over which long-forgotten wingman once ran in the Grand Final Sprint for your VFL-AFL club. 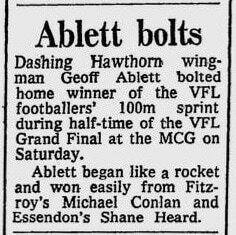 Of course everyone around the BBQ agrees that Ablett "won a lot of them" but nobody can remember if it was Gary senior or one of the other Abletts. Well, it's time to end the debate - study up using HardBallGet's new guide to the Grand Final Sprint and you can silence the doubters at your Grand Final party. VFA CENTENARY CUP - missing match report for the 1977 2nd semi-final added and venue confirmed as Lake Oval, South Melbourne (some online sources stated the match was played at Toorak Park, Prahran) - my thanks to Andrew Robinson for this information. Includes all those cricket scores run-up in the 1980s such as Williamstown's 55.17 (347) against Camberwell who kicked a mere 4.8 (32) - a winning margin of 315 points! The rivalry continues! Includes the long-forgotten practice games of 1898-1906 and the 1924 "Championship of Victoria" between Essendon (VFL) and Footscray (VFA). Played as curtain-raisers for the VFA Finals Series - also includes Essendon's Charity Cup victory of 1896. VFA GRAND FINALS - my thanks to Richard Attard for alerting me to some typos in the Grand Final scores and for taking the time to review all of them for me. Amendments have been made and the goal umpires can now salute the scoreboard to signal that scores are correct. 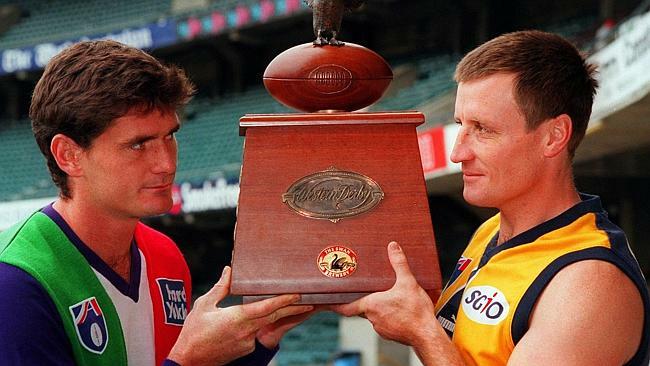 The NFL Night Series era was one of the most tumultuous periods in the history of Australian Football, yet the struggles of that time have been largely forgotten. Over four seasons the National Football League (NFL) and the Victorian Football League (VFL) battled for control of the game. 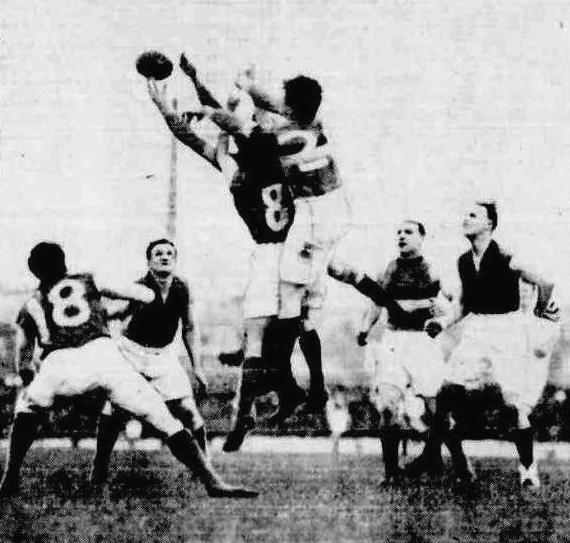 The NFL, as football's governing body, planned to create the first national competition but the VFL, as football's biggest State League, had their own national expansion plans that they were determined to follow. Throughout its rich history, the VFA has presented a number of individual awards to recognise the achievements of its players. The earliest awards such as the Woodham Cup, Todd Medal, and Liston Trophy were named in honour of long-serving administrators. In recent times awards have been named after legendary players such as Frank Johnson, Jim 'Frosty' Miller, and Barry Round. 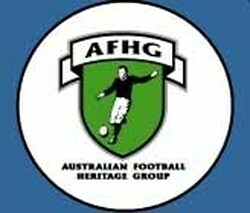 Mordialloc's Geoff Rosenow - coach of the 1984 VFA Division 2 rep side - added to the Honour Roll. Thanks to Noel Menadue for this info. Missing scores from the 1981 VFA (Div.2) vs Australian Services practice match have been added - thanks to cobrascorer from www.vflfooty.com for this info. Missing VFA Grand Final info (1990/92/96) and ladder positions 1996/97/98/99 now crossed off the list - my thanks to Ron Doe, Bruce Kennedy, and Andrew Robinson for this info. Gilbert Major, South Melbourne's 1881 skipper is now added to the VFA-VFL Honour Roll. For his research, Colin is officially awarded a hard ball get from HardBallGet.net!!! Many modern football fans have been deluded into thinking that top level football in Victoria started in 1897 when the VFL was formed. In fact, the clubs and players that formed the League were originally part of the VFA which had been in existence for 20 seasons. The Association's crucial role in the formation of the game has been largely overlooked, now it's time to bring those champions of the pre-VFL era into the spotlight.